Water • $50 million upgrade will help protect Morgan County downstream. Steve Griffin | The Salt Lake Tribune White pelicans catch updrafts as they glide above Echo Reservoir near Coalville on Monday, July 16, 2012. Steve Griffin | The Salt Lake Tribune View of the spillway at the Echo Dam near Coalville, Utah, on Monday, July 16, 2012. 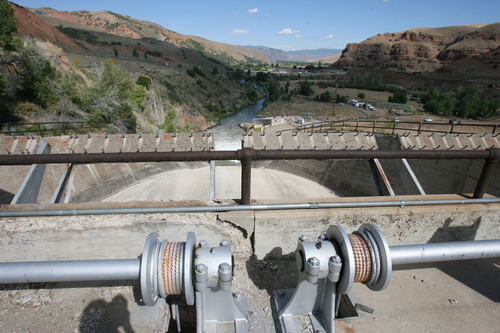 The federal Bureau of Reclamation is making seismic safety modifications to the dam. Studies indicate that potentially liquefiable materials are present within the dam foundation. 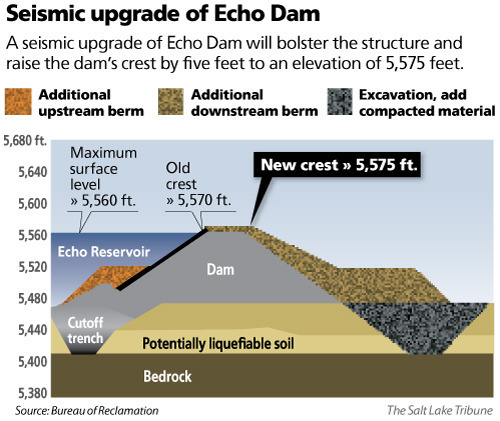 Steve Griffin | The Salt Lake Tribune Bureau of Reclamation crews are making seismic safety modifications to Echo Dam. Studies indicate that potentially liquefiable materials are present within the dam foundation. 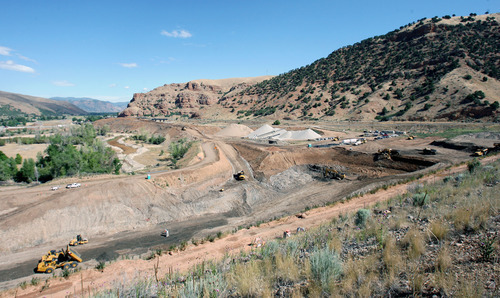 Reclamation crews are removing the dirt and replacing it with dense, compacted material. Steve Griffin | The Salt Lake Tribune White pelicans catch updrafts as they glide above Echo Reservoir near Coalville on Monday, July 16, 2012. Steve Griffin | The Salt Lake Tribune White pelicans catch updrafts as they glide above Echo Reservoir near Coalville on Monday, July 16, 2012. Steve Griffin | The Salt Lake Tribune Bureau of Reclamation crews are making seismic safety modifications to Echo Dam. 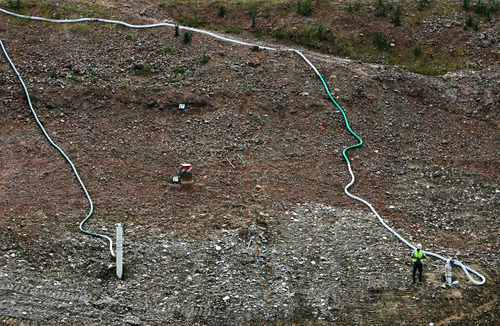 Studies indicate that potentially liquefiable materials are present within the dam foundation. 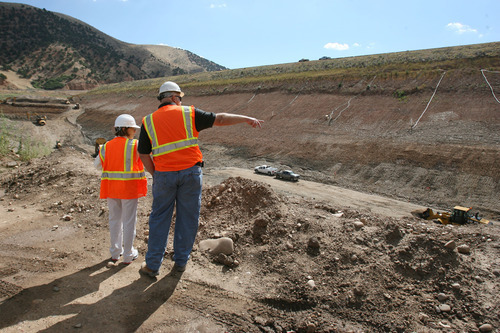 Reclamation crews are removing the dirt and replacing it with dense, compacted material. 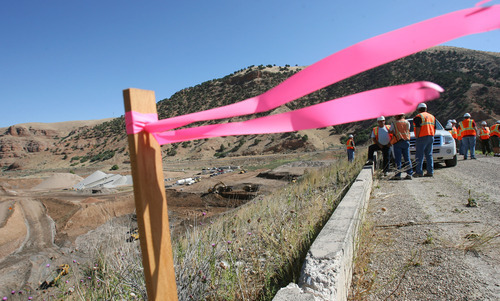 Steve Griffin | The Salt Lake Tribune Bureau of Reclamation crews are making seismic safety modifications to Echo Dam. Studies indicate that potentially liquefiable materials are present within the dam foundation. Reclamation crews are removing the dirt and replacing it with dense, compacted material. Steve Griffin | The Salt Lake Tribune Bureau of Reclamation crews are making seismic safety modifications to Echo Dam. Studies indicate that potentially liquefiable materials are present within the dam foundation. Reclamation crews are removing the dirt and replacing it with dense, compacted material. Steve Griffin | The Salt Lake Tribune Bureau of Reclamation crews are making seismic safety modifications to Echo Dam. Studies indicate that potentially liquefiable materials are present within the dam foundation. Reclamation crews are removing the dirt and replacing it with dense, compacted material. Steve Griffin | The Salt Lake Tribune Bureau of Reclamation crews are making seismic safety modifications to Echo Dam. Studies indicate that potentially liquefiable materials are present within the dam foundation. Reclamation crews are removing the dirt and replacing it with dense, compacted material. Steve Griffin | The Salt Lake Tribune Bureau of Reclamation crews are making seismic safety modifications to Echo Dam. Studies indicate that potentially liquefiable materials are present within the dam foundation. Reclamation crews are removing the dirt and replacing it with dense, compacted material. 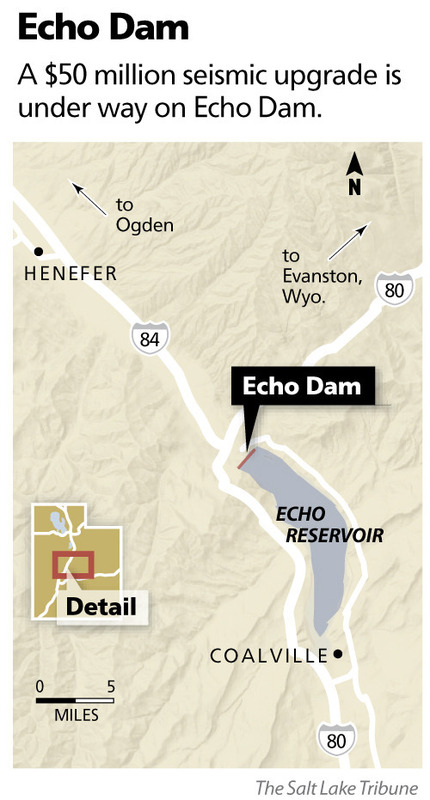 Coalville • Echo Dam is 82 years old, and it's getting a makeover  a $50 million seismic nip and tuck. Studies beginning in 1998 revealed that the 158-foot-high earthen dam along the Weber River in northeastern Summit County is sitting atop a "liquefaction" zone, where soils can become unstable during an earthquake, said Curtis Pledger, Provo area manager for the federal Bureau of Reclamation. 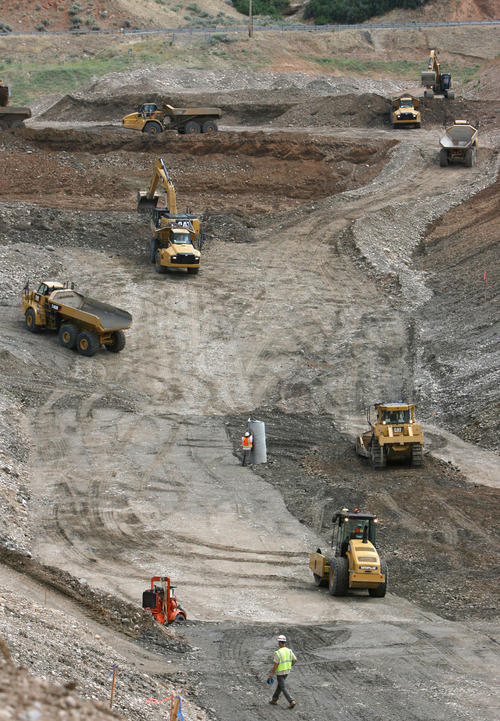 The zone is on the dam's downstream side, where crews began excavating in early June. They will dig down to bedrock, removing about 665,000 cubic yards of soil and gravel and refill the excavated area with what Pledger described as "stable material" that will not liquefy in a temblor. 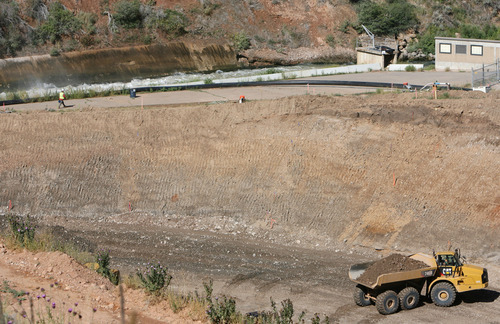 Crews also will construct berms abutting both sides of the dam that will allow it to withstand a 6.5 magnitude quake on the nearby Main Canyon Fault, which runs between Henefer and East Canyon. That would be equivalent to a 7.5 farther away on the Wasatch Fault in the Salt Lake Valley. All told, Pledger said, the crews will end up stabilizing the dam with 1.2 million cubic yards of material. The spillway also will be reconstructed by the project's finish date in September 2014. Seismic studies now show that a 4.5 magnitude quake along the Main Canyon Fault could cause soils beneath the dam to "sag," leading to a failure that most likely would result in the loss of life and property downstream, particularly in Morgan County. When full, Echo Reservoir holds 74,000 acre-feet of water. 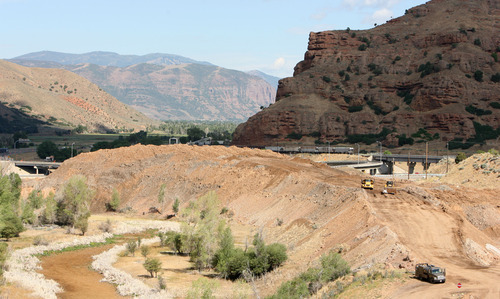 If the project did not go forward, the Bureau of Reclamation would allow the Weber River Water Users Association  which owns and operates the dam  to fill the reservoir to only 56 percent of capacity, said Manager Ivan Ray. "That would not take care of all our downstream demand," Ray said, "particularly in a dry, hot year like this one." The reservoir is now dropping 12 inches per day due to demand. The federal government will pay 85 percent of the project's tab. The water association is on tap for the balance, about $7.5 million. The association has irrigation contracts on 109,000 acres of farmland and 38,000 secondary water hookups, mostly in Davis and Weber counties. Rates for users will not increase, Ray said. The debt ­will be retired on a no-interest federal loan over 40 years, Ray said. About half the funding will come from electricity generated at the dam for the Bountiful Power & Light Co.